Below is a press release from our DC regarding their Paddle for Clean Water. 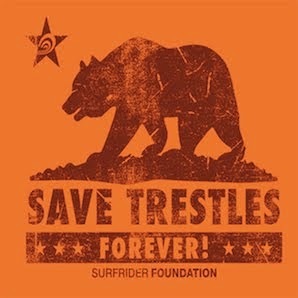 This year, the Chapter is co-branding the Paddle with the Save Trestles campaign. A handful of So Cal Surfrider activists will be heading to our Nation's Capitol to be part of a press conference in order to raise awareness about the upcoming Federal Government hearing that will take place on Sept 22 in Del Mar, CA. WASHINGTON (September 2, 2008)--The Washington, DC, Chapter of the Surfrider Foundation will hold its 14th annual Clean Water Paddle on the Potomac on Saturday, September 13, 2008. The event will occur from 10 am to 2 pm at Thompson Boat Center in Georgetown. Participants will paddle surfboards, canoes, kayaks, or any non-motorized watercraft from the boat center to the Key Bridge and back. Paddlers will also clean up trash around and on Roosevelt Island. More than 100 local residents are expected to participate. Prizes, refreshments, and educational materials will be available. The Clean Water Paddle on the Potomac aims to raise awareness about water-quality and watershed issues. This year, the Paddle will focus on both local and national issues affecting water quality and recreational opportunities. Local water quality problems such as the outdated combined sewer system and urban runoff are compromising the integrity and health of waterways. Poor water quality damages the region’s ecosystems and recreational opportunities like paddle sports, wakeboarding, fishing, and swimming. Even urban renewal is delayed as the rivers lack the desirability that waterfront communities normally foster. The polluted Potomac and Anacostia Rivers further weaken the fragile Chesapeake Bay, a national environmental, recreational, and economic treasure. This water ultimately winds up in the ocean, where countless DC-area residents enjoy summer vacations and recreation. The health of our rivers directly affects the health of our oceans. As the chapter slogan says, It’s an upstream battle. DC Surfrider recognizes its unique position as a local chapter in the presence of national lawmakers. In partnership with fellow chapters in Southern California, we also are concerned about larger issues such as the proposed toll road through San Onofre State Beach. This private development will invade precious undeveloped public lands and in the process severely degrade water and wave quality at Trestles, the only venue for professional surfing competitions in the mainland United States. The developers’ appeal of the California Coastal Commission’s rejection of the toll road is currently before the U.S. Secretary of Commerce. The secretary’s decision will affect not only the preservation of the wave and environment at Trestles but potentially the management and use of public lands in the long-term. The Surfrider Foundation is a non-profit grassroots organization dedicated to the protection and preservation of our world’s oceans, waves, and beaches. Founded in 1984 by a handful of visionary surfers, the Surfrider Foundation now maintains over 50,000 members and 75 chapters across the United States and Puerto Rico, with international affiliates in Australia, Japan, Europe, and Brazil. Wonderful photos of our land.. Thank You! Trestles Hearing Successful!